The NEC SV8100 8-Port Digital Extension Daughter Card PZ-8DLCB is connected to the CD-8DLCA card and expands the SV8100 system by a further 8 digital extensions. This card is one of the most popular ways to add further digital extension - also known as "stations" or "terminals" to the NEC SV8100 telephone system. This card allows you to add expansion capabilities on a more gradual basis. 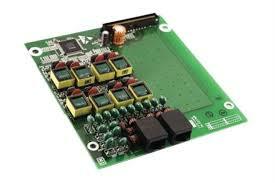 As with the main Digital Extension Card, this board allows 8 additional DT300 series telephones and/or DSS Consoles.